There's adventure to be had on the high seas when a group of press-ganged pirates becomes embroiled in the plots and plunder of the Shackles—an infamous island chain dominated by pirate warlords. But as these new swashbucklers make names for themselves, rival scalawags, enemy navies, legendary sea monsters, and the infamous Hurricane King himself seek to see them walk the plank. Who will survive when there's loot on the line? Launch a campaign to control the Shackles with the Pathfinder Adventure Card Game: Skull & Shackles Base Set. This complete cooperative strategy card game pits 1 to 4 heroes against the traps, monsters, deadly magic, and despicable foes of the Pathfinder Roleplaying Game’s award-winning Skull & Shackles Adventure Path. Choose your character’s class; build a deck of allies, equipment, and magic; and explore lethal locations as you journey through multiple scenarios in an exciting fantasy adventure. Characters grow stronger after each game, adding unique gear and awesome magic to their decks, and gaining incredible powers, all of which they’ll need to challenge greater threats in a complete Pathfinder Adventure Card Game Adventure Path. More than 500 cards featuring a richly customizable assortment of equipment and magic, and dozens of allies, monsters, and villains from the Skull & Shackles Adventure Path. 7 character classes to choose from, including 4 brand-new ones: Gunslinger, Magus, Oracle, and Swashbuckler. Supplement your Skull & Shackles experience with the Character Add-On Deck and monthly Adventure Decks (sold separately). I was interested in the Pathfinder Adventure Card Game when Rise of the Runelords was released, but I decided not to invest in it because it seemed evident that this game takes a lot of time… time I really didn’t have unless I was willing to play it to the exclusion of everything else. When a family emergency kept me stuck at home with my toddler for 14 days a few months ago, with nobody to play games with or even talk to, I was restless for something I could play solitaire. I immediately ordered everything I could get for PACG (now onto the Skull & Shackles set) and dove into it obsessively every time my little guy went to sleep. My playing slowed down quite a bit when life returned to normal, but not because I want to play it any less! Here are some opinions. It takes a decent amount of time to get through the rulebook with an understanding adequate to actually play the game – for me it was around 2 hours before I dared brave playing. Several mistakes were made that first game, and it wasn’t until game 3 or 4 that I was adhering to all rules. Even though the components are mostly cards (there’s 5 dice also, but that’s it), it still takes a little time to get everything ready for that first play. In addition to unwrapping the cards, you’ll need to separate them into types – and there are a LOT of different card types. It will take a good 30 minutes to set the game up the first time; that reduces to about 10 minutes on future plays. The stated play time of 90 minutes can vary widely between scenarios – some are finishable in 45 minutes, while others take the full 90. As mentioned, the rules took a good 3 or 4 games before I had the hang of them. Getting decent at the game takes much longer. I put together several 2- or 3-character teams and started running them through the introductory scenarios only to have them die by the 3rd or 4th mission. I learned some valuable lessons on the importance of having a varied team with different specialties (rather than loading up on fighters) and making sure the right characters are in the right locations based on what’s likely to be drawn. As for teach time, this is the only game I’ve played where I can’t weigh in – I have never played with others, and thus never had to teach it. Another area I can’t weigh in, as the group has been me, myself and I (or as my multiple personalities like to call themselves – Oloch, Lem and Valeros). However, I can see that this would be an outstanding cooperative game to play with anybody who likes dungeon crawlers or exploration-heavy games… and games that stay with you for months while you work your way through them. This should be a big hit with Power Gamers. Due to content and gameplay, this isn’t a game for children. It’s difficult, with rules that will never be labelled “simple”. There are a bunch of Monster cards that have mature, scary (to a child) illustrations. And while there’s no gore or violence depicted directly on the cards, it’s pretty inescapable that you’re constantly fighting everything you come across. Thematically this is a close tie to its Pathfinder ancestry – you’re swapping deck-building mechanics and cards for dense rulebooks and DMs, but it will certainly scratch the same itch. And while deck-building is a big part of the game, this isn’t at all like deck-builders. This game stays with you for 35 to 50 hours while you work your team through the whole story. The only game that has given me a similar feeling is Arcadia Quest – while it is competitive and miniatures-based, both games have you building strength through exploration and monster-slaying, and both let you grow through multiple game nights and make your characters something more than pawns on a board. Both Arcadia Quest and PACG are fantastic for us would-be Power Gamers who don’t have long stretches of available time to truly be Power Gamers. Skull & Shackles had a lightning-quick rise from purchase to Favorites for me. It gives me a chance to work long hours at developing my group of adventurers… but rarely requires me to give that time in more than one-hour increments. The story is fascinating, the characters are varied (particularly if you purchase the Character Add-On Deck or Class Decks)… and most importantly, the game is very challenging. And in case this wasn’t evident – this is one of the best solo experiences out there. 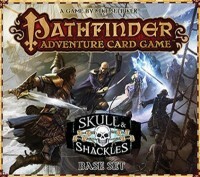 Pathfinder ACG Skull and Shackles is the second entry in their Adventure card game series. The number of players goes from One to Six, and is played over a series of “adventures” across several scenarios. Cards, a lot of them if you count in the expansion scenarios. The insert is functional for the base set with out the expansion scenarios. You will most likely be making a new insert for it or buying one online or from a convention/store. The quality of the cards is best put at mediocre. Setup is pretty easy as you follow what the location cards tell you to put there (IE: 4 Monsters, 3 Items, 2 Weapons, etc). Each player begins play with a character of their choosing and a deck of 15 cards. This will change and grow some over the course of play. Players “move” their character to a location, explore it, encounter the top card of that location deck. Play a card(s), roll some dice then add in some other numbers to get their result. Either you make it or you don’t. Unfortunately PACG Skull and Shackles keeps up the tradition of its predecessor in being a really boring, arbitrary, formulaic, and repetitive game. The first couple of plays are good, but then you realize how the game is designed and realize its rather quite boring. This character min-maxes this, that one min-maxes that to be able to do this stuff. Play weapon, item, or spell and maybe a blessing to get more dice. You pick up and roll them and then add in modifier numbers. There is really no choices in this game. It is all random luck. If the dice are on fire you will do good, if not well then the opposite happens. I know a lot of people seem to sing nothing but praises for this game. I may have the unpopular opinion on this, but the game is just boring after the first couple of games when you figure everything out. There is only luck in this game, no skill or thinking involved. Its just a flip and see what happens game. Which IMO is a bad design for a game now days, maybe a decade or two ago with would be great. If you want a dungeon crawl there is Decent, Imperial Assault, the D&D board games(all GM-less), Thunderstone Advanced is a way better card game choice, that give better experiences and have you interested in what other people are doing on their turn. I found myself and the other players grabbing our phones to play other games, or else setting up side games and getting more involved in those then the Pathfinder Adventure Card game. There is no incentive to want to encounter monsters or obstacles other then you are forced to. I think Paizo needs to look at the Thunderstone Advance card game and see what they did right. That played way better. Path S&S is the second instance in the Pathfinder ACG. This time around we’re heading out on the high seas in a pirate themed adventure. Basically it is the same as its predecessor with 6 adventure packs added to the basic adventures to form the entire campaign. In total there are 35 scenarios to get through to complete the adventure path. Those familiar with Rise of the Runelords can safely skip this part. First off each player must choose a character to play. Each character has three areas of importance. Each character starts with 15 cards and may be chosen freely as long as it confirms to the card type limit and only contains basic cards. The deck is also important as it serves as your life pool as well; if you ever find yourself having to draw a card without any left you are killed and eliminated from the game. During each scenario you’re likely to find new and improved gear which will improve your deck for future encounters. Each scenario lists the locations needed dependant on the number of characters playing and each location has its own encounter deck which must be prepared with banes (monsters and barriers) and boons (good stuff). In addition the villain or henchman will be shuffled into the deck. The goal is (usually) to corner and defeat the villain by closing all other locations. This is done by finding and defeating a henchman and performing the closing requisite of the location. So, what are the differences between the two campaigns? First thing one will notice is the boat(s). You’re on a boat and there are several cards that improves when used by a person on a boat. Usually you’ll be captaining the boat on your turn but for several scenarios it will also be anchored up at a specific location. What does the boat do? Not much really, it will start with a plunder (boon) which you’ll receive at scenario end but several cards will affect it and may cause structural damage to it which may need to be fixed. You will also encounter other ships for battle and during the campaign you’ll get better ships as well. However, the biggest difference is by far the variety of scenarios and how different they are. In RotR, you felt it was basically the same thing over and over again with a major focus on combat and frankly, combat gets fairly easy as characters improves. While this may be the case in S&S also, combat has taken a major step back and given way to lots of different interesting choices. Scenarios are much more fun (and harder), locations a lot more challenging and you are using lots of different skills. There is actually quite a lot of planning going on and on several scenarios you may be forced to autofail to survive. I did enjoy RotR, but S&S is a much improved version of the Pathfinder ACG. If you enjoyed the first game, you’re very likely to enjoy this one and if you’re considering making the splash into the games you might as well go directly here. There is no need to drop by the Runelords first unless pirate theme just isn’t for you. In short, this is the deck building game based on the RPG Pathfinder Adventure Path: Skull & Shackles. Before the game begins, each player chooses the one character you want to play, putting together their deck with weapons, spells, armor, allies, other equipment and blessings (which can be described to be help from the gods). Along the way you will come across new and better cards that you can replace with the one already have. The game is about completing a series of “scenarios” where the action takes place in the pirate-islands – The Shackles; an archipelago of coastal hazards, enemy ships (pirates) and many treasures. Each “scenario” consist a description of the mission, 3-8 locations task to be solved, what it takes to win and what you get by winning. For those familiar with the previous Pathfinder Adventure Card Game: Rise of the Rune Lords, one has an idea of ​​what this game is about. But …..
One change from the first PACG this one introduces a number of new (and in my opinion more interesting and varied) rules. Ships are perhaps the easiest to notice, but there is much else that makes this a much more interesting game than its predecessor. “Scenarios” are much more varied from the very beginning. Where to its predecessor did exactly the same in almost all the 33 “scenarios”_, developers have in S&S taken the feedback from players seriously and developed larger and more frequent variations of how to win a “scenario”. The characters you play is new, however, one can recognize some from the previous PACG (these are changed for the better to match Skull & Shackles), and are more balanced. Unlike its predecessor, where you could do fine with specializing you character, you are more compelled to build character width in you character to even be able to solve quests. This can be done by either using the points you get by completing “scenarios” or by adapting your deck. And as I have already mentioned; S&S has a much greater variety of ways to solve quests making the game much more interesting than its predecessor. The game is well suited for solo play, even though it would be a more social experience to be more players. I’ve tried both, and when I play alone I control two characters. PACG: Rise of the Rune Lords is a very well-used game in my collection, and the game I have played most of all the games I own. That I’ve played it over 150 times (scenarios) is probably no exaggeration. But with the newcomer Skull & Shackles I’m afraid I’m going to equal the number of played “scenarios”! Skull & Shackles is the game Rise of the Rune Lords should have been, and with all expansions scheduled (class deck, where you get 4 new characters in each of the 7 classes late), this is a game I’m going to enjoy throughout the year and beginning of the next. Some will say that the game is expensive when you add up everything you can buy. I do not disagree, but with the number of hours I’ve spent on Rise of the Rune Lords, I conclude that I’ve had a lot of fun and the time/money ratio isn’t that bad at all! For anyone who’s played the Pathfinder Adventure Card Game: Rise of the Runelords, Skull and Shackles will be extremely familiar. The components are of equivalent stock, with minor improvements (the D10 now has a “10” rather than a “0”, helpful for players unfamiliar with the traditional RPG polygon). So lets talk about what’s new and fresh. The base game comes with 7 characters. There are a few returning from Rise of the Runelords, but in different iterations. They are mechanically different, but not so much that they feel like different characters. I have mixed feelings about this, as I would have loved new original characters, but I understand the need for “Base” classes in a classic RPG. The new characters introduced are very evocative of the new setting, like the Gunslinger and Swashbuckler. The rules were also streamlined. The designers took the (abundant) feedback and clarified some things that players were commonly posting questions about. The fact that the designers have been so receptive to player feedback is one of the little joys of PACG and proves that they are committed to providing the players the best product possible. The newest addition to the game however was the Ships. Ships provide new ways for the party to move that feel thematic and mechanically sound all at once. In addition ships allow you to loot other ships encountered. This gives the game that little bit of flavored topping while letting the party get a little more bang for their buck. All in all the follow up to Rise of the Runlords is both new and familiar. By choosing the pirate themed adventure they were ablet to differentiate enough from the classic dungeon crawl without abandoning what makes PACG so fun. I can’t wait to see what’s next, both in Skull and Shackles and whatever follows it up. Add a Review for "Pathfinder Adventure Card Game: Skull & Shackles (Base Set)"